From Page to Stage Part IV - Marketing the Mermaid! 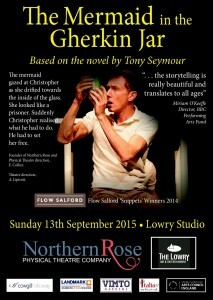 The physical theatre adaptation of ‘The Mermaid in the Gherkin Jar’ hits The Lowry with two shows on Sunday 13 September 2015. My input thus far, has been fairly limited, as I intended. 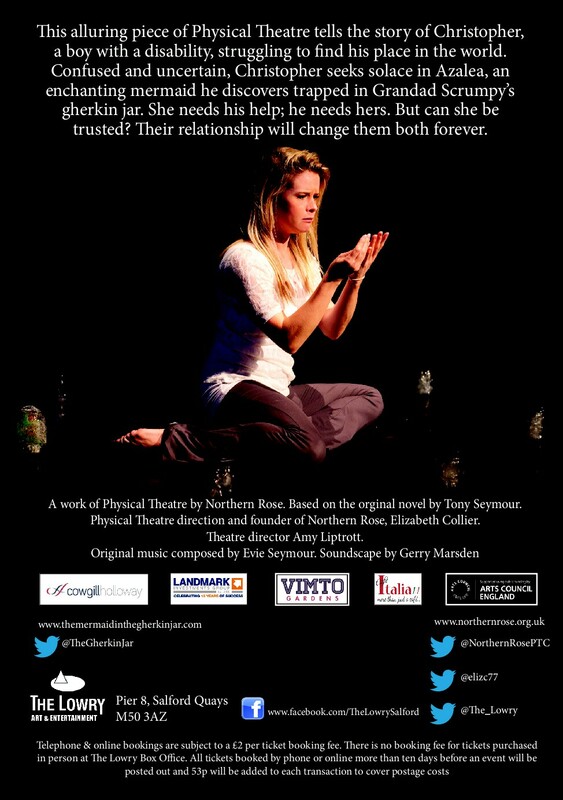 The lovely people at Northern Rose have been kind enough to keep me involved throughout the development of the piece, but it had always be my intention to let Liz Collier and Amy Liptrott focus on what they do best, without interference from an overbearing author! However, I did get the opportunity to involve myself a little more with the production of some of the marketing material. There’s a part of me that has always been interested in the art of promotion. I am, after all, a salesman at heart! So when the subject of posters, flyers and other production paraphernalia was raised, I couldn’t resist the temptation to dip my toe into the water! As far as the flyers and posters were concerned, we wanted something that, like the play itself, would capture the imagination of a potential theatre-goer, whilst giving them a flavour of what they could expect to see. 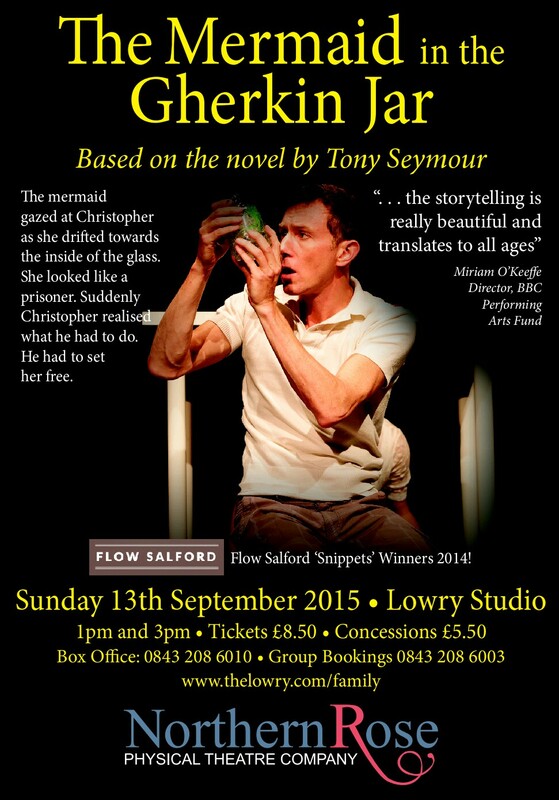 Fortunately we had a number of excellent photographic stills taken when the show won the original Flow Salford Snippets in 2014. The image of Christopher, played by Richard Hansell gazing hopefully into the murky gherkin jar was a perfect example of what we were going for. There’s something about that picture that immediately grabs one’s attention. 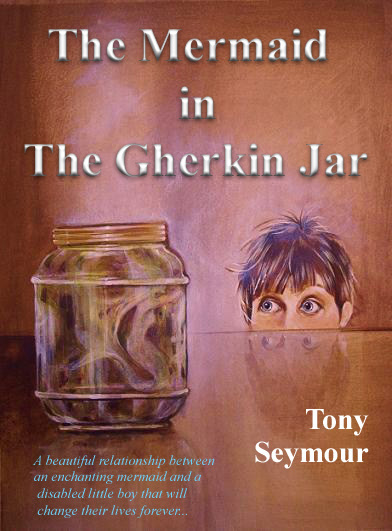 What is Christopher looking for in the mysterious gherkin jar? What answers does he hope to find? And how on earth can such a thrilling adventure begin in such an unassuming place?! On the reverse, we see Amy Berry as the unpredictable mermaid, Azalea, after she is freed into Christopher’s grandparents’ garden pond. The pond is depicted by a ring of gherkin jars which surround the mythical creature. The importance of the jars in forming part of Christopher’s world has been explained in previous blog posts and it was no accident that they were given a certain prominence in the marketing material. With thanks to all our wonderful sponsors! Both images also set the tone beautifully for what’s in store for the audience on 13 September. The low-fi approach taken by Northern Rose in developing this particular interpretation of the story has the effect of really getting to the core messages behind the work and it was crucial that the promotional material reflected this. However, although the representations of Christopher and Azalea do carry a certain simplicity and starkness, there is something about these two images which also create a sense of ‘richness’ concerning the nature of the performance. The ensemble cast of Richard and Amy results in a alluring family production, communicating powerful messages whilst losing none of the magic and charm of the original story. It is a brilliant balance of drama, intrigue and wonder. True, a poster can, at best, only ever represent a snapshot of the full performance, but I think the artwork really does give a sense of what the live production delivers so well. The marketing copy also provides the opportunity to recognise those who have been so kind as to lend their support to this project so far. This production, as well as so many others, would not be possible without the pivotal support of the Arts Council who fund a large number of worthy endeavours each year. On a more regional level, North West firms such as Landmark Investments and Cowgills have been behind the stage adaptation of ‘The Mermaid in The Gherkin Jar’ since the beginning whilst Café Italia has been kind enough to provide vital rehearsal space in the run up to the opening night. 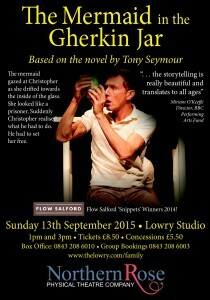 Of course, non of this would have been possible if it was not for the help and guidance of The Lowry Theatre itself, especially individuals such as Matt Eames (Associate Producer at The Lowry) and Miriam O’Keeffe (Director, BBC Performing Arts Fund) who recognised the potential of the piece when it won Flow Salford Snippets back in 2014. 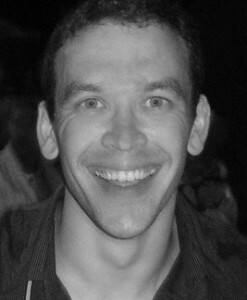 Since then, their continued interest and guidance has been greatly appreciated. So, it seems the stage is almost set. The first phase of rehearsals has been a massive success and the wheels of the marketing and promotion machine are beginning to turn, with tickets going on sale in July. There is still much to be done before September, but there is little doubt that the journey from page to stage is on a steady course to culminate in a really fantastic show.